The Protein Data Bank Europe issued a challenge to students to create a piece of artwork that incorporates science (via their collection of protein molecule images) with art. I was intrigued by this idea of crossing the boundaries of art into science and vice versa, and was excited by the opportunity to have access to PDBe’s specialist software to design some interesting images for use in my project, and subsequently chose to attempt my own interpretation of this challenge. One idea for inspiration they presented me with was bioluminescent proteins; an area of biology which I knew little about, and after some research into the science behind bioluminescence and its uses, I found it an interesting topic to research. Bioluminescence is primarily a marine phenomenon and is the predominant source of light in the deep ocean, accounting for the largest habitable volume on Earth. It is thought that around 60-80% of deep sea fish are bioluminescent. However, bioluminescence is primarily absent in fresh water (with a few exceptions). On land it is most commonly seen as glowing fungus on wood (called foxfire), or in a few families of luminous insects. Some organisms emit light continuously, but most emit flashes of durations ranging from about 0.1 s to 10 s. At least two chemicals are required; the one which produces the light is generically called a luciferin, and another that catalyses the reaction called a luciferase. 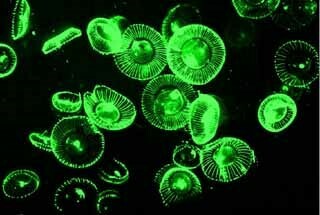 Because it is found in so many different types of organisms, bioluminescence must serve many functions in the ocean. However, many of the functions are still unknown, because experimental evidence has been gathered for only a few of the many proposed roles. Luminescence can serve two or more purposes, both offensive and defensive, within a single organism. Examples of functions include startling pray, luring prey or illuminating prey. Also, certain species of bioluminescent squid alter the amount of light they emit to camouflage with the gradients of darkness in shallow and deep water. After researching this, I concluded that the idea of fluorescent proteins could offer opportunities for exciting visual effects if I could create a piece that glowed. I then decided that I would make a garment, specifically a dress, as I wanted to explore the process of making a 3-dimensional, wearable piece of art; an area of art that I am relatively inexperienced in. I used PDBe’s website to find the pattern for fluorescent proteins, such as 3ssh from the source organism Aequorea Victoria, sometimes referred to as a crystal jelly [fig.1], which I then imported into their software ‘Chimera’. I used this as a starting point to design a protein that would be suitable for use with laser cutting and then took this image [fig. 2] and turned into a simpler, 2-dimensional image on 2D design software. This enabled me to cut out multiple copies of the image in different sizes using a laser cutter. I used cartridge paper to do this as I decided that regular paper would be too thin and calico fabric would too flexible without being starched to shape into the 3D shape I had designed. After a couple of attempts of cutting out the molecules, the laser-cutter setting was adjusted so that it cut all the way through the paper and didn’t leave obvious scorch marks. I researched fashion designers who I could use as inspiration for designing my dress, and found two designers that stood out to me; Iris Van Herpen and Rami Kadi. Van Herpen’s fall collection from 2016 displayed garments that had been created using laser cutting, consisting of a simple dress beneath a more complex, mesh layer of laser cut material, with segments in different shapes and sizes. I liked how this fabric had been laser-cut to give the effect of lace from afar, with the intricacy only being apparent from close-up. Also, I was intrigued by how the mesh layer sat above the dress itself, seemingly floating above the dress. Kadi’s fall collection from 2015 exhibited black dresses with glow-in-the-dark insects embroidered across the garments; inspiring me to use glow-in-the-dark paint to recreate this effect. Moreover, I was intrigued by the idea of designing a garment that had two different appearances; one in the light and one in the dark. I practiced figure drawing and making fashion sketches so that I could produce a few different designs for the dress. I decided to create a dress consisting of two parts; a black dress and a white mesh layer over the top, much inspired by Iris Van Herpen’s designs. I pinned the black fabric onto a mannequin into a long dress with a straight skirt, which provided a dark background to assist the glowing effect. I chose to make the dress with a straight skirt so that I could experiment more readily with making the molecule layer ‘flow’ across the dress and protrude off the body of the garment. I sponged glow-in-the-dark paint onto the cut-out shapes so that the paper didn’t warp with too much liquid, and to ensure that they glowed brightly I applied 3 layers of paint. Then, I pinned the molecules onto the dress to create a lace-like effect. I interlinked the separate molecules so they all link together to form one large surface and that from a distance the molecules appear to be one sheet of fabric rather than individual shapes. Larger cut-outs were used over the body of the dress and for the shoulder, and the medium and smallest cut-outs were used to make a trim for the edge of the top layer. The molecules sweep up one side of the dress and over opposite shoulder, and to create a floating effect there is a section that bulks out to the side and hangs off the body. There were many ideas that I wanted to portray through this project. Primarily, I wanted to create a piece of art that brought together art and science in an exciting and unique way, emphasized not only by using images of the bioluminescent protein, but by using modern technology in the form of the laser-cutter, expressed through the medium of textiles. Visually, the blackness of the dress represents the dark waters of deep sea habitats where bioluminescent commonly occurs, and the green glowing molecules mirror the bioluminescence of organisms such as the Aequorea Victoria. However, the use of molecules as the basis for my design allowed me to delve deeper into the science behind bioluminescence, rather than expressing it simply as how we see it; as a jellyfish, for example. Additionally, the mesh layer ‘floats’ off certain areas of the dress, resembling how the fluorescent proteins would be suspended in water as part of the deep sea organisms and the flowing movements they perform underwater. The molecules are all interwoven to perform a function, just as molecules do in real life. In reviewing my project, I am pleased with the final outcome, especially the effectiveness of the laser-cut molecules and how brightly the dress glows in the dark. If I were to recreate the dress, there are a number of changes I would make. If I had more time I would make the dress wearable and assemble the dress itself from a set pattern, and potentially in a different style, rather than simply pinning it onto the mannequin. To add to this, it would be more wearable if the molecules were cut out of fabric, such as calico, so I would experiment with starching the fabric to find out if I could achieve a stiffness that allowed me to bend the pieces in a way similar to the cartridge paper.